Unlike the legionaries who were stationed primarily on the frontier, marching throughout Europe, the Guards were based in Rome and stood as the main body of troops in the defense of the Roman Empire. These elite soldiers were the Emperors personal instruments for discouraging plots and rebellions and were quite effective in crushing unrest. 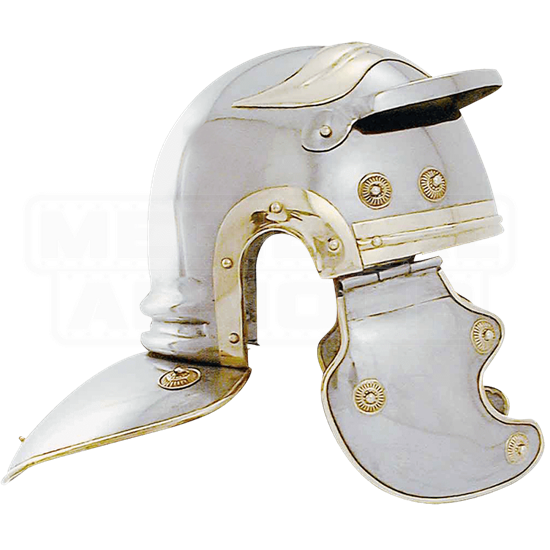 This Gallic influenced full size wearable helm worn by the elite Roman guardsmen of the early first century is handcrafted of 18 gauge steel and boasts classic brass accenting. This is a most interesting addition to ancient armour collections. The Roman Guards Helmet is fully functional and wearable for Roman re-enactments. This interesting Roman helm would be a great piece for your Roman Lorica Segmenta also.